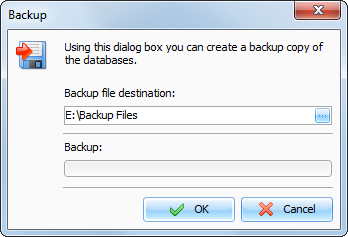 The Backup function is used to create a backup copy of Interactive Calendar databases. It creates a CAB archive file, which contains a program's database. You can use this file to restore database if it will be necessary. To make a backup copy, click the "File - Backup" Interactive Calendar main menu item. Specify the backup file location. You will see a progress indicator of the backup at the bottom of the window. When backup completed, you will receive an appropriate message.